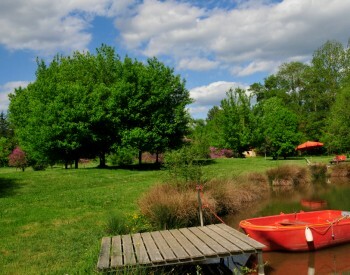 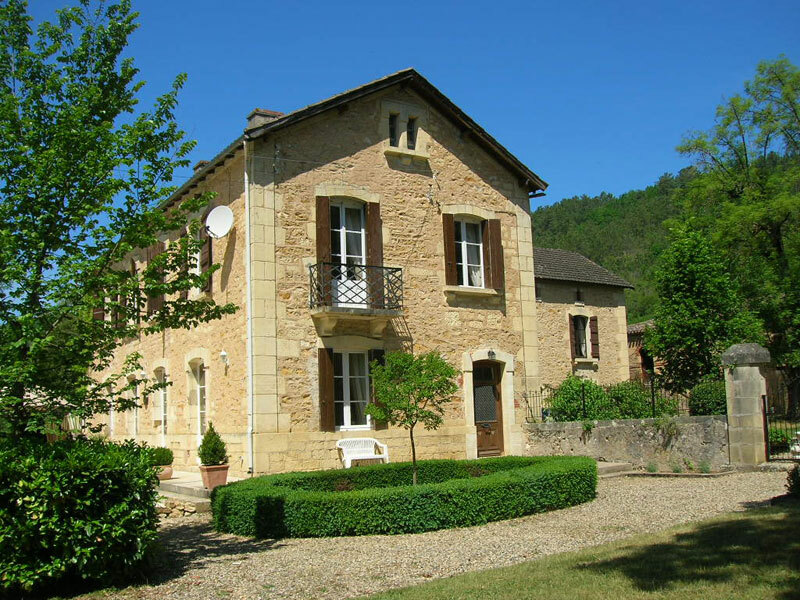 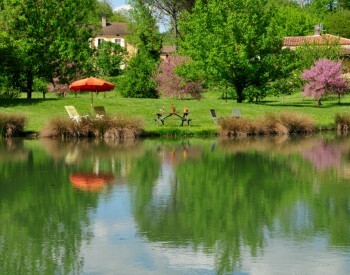 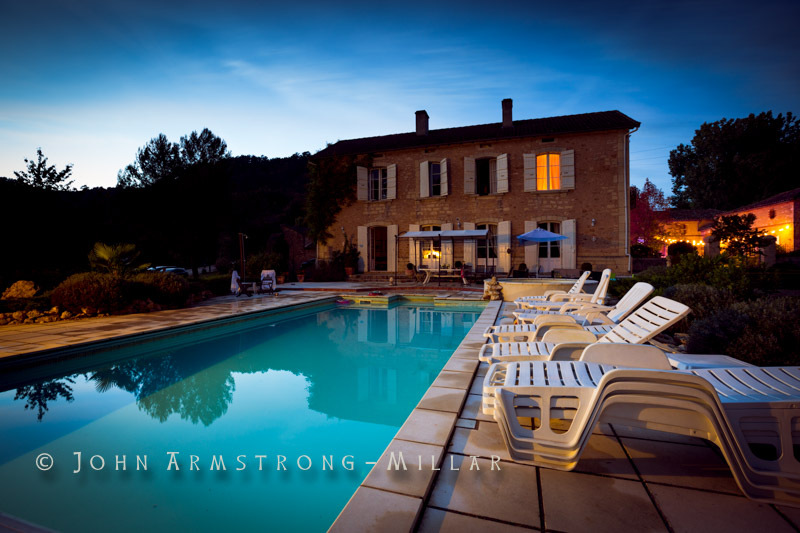 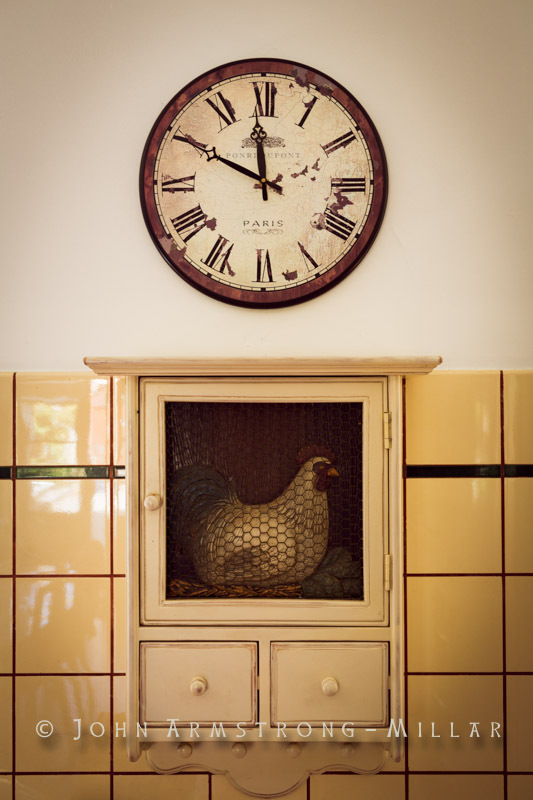 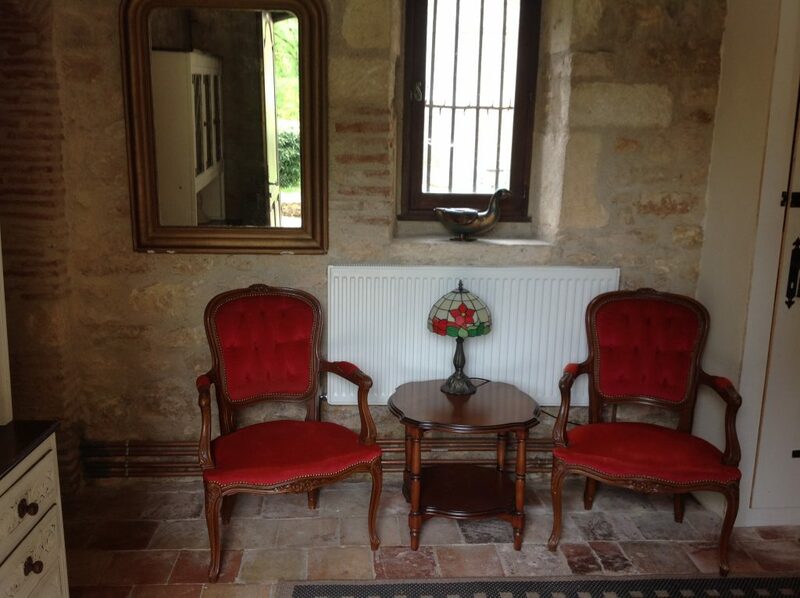 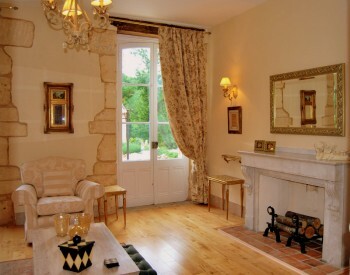 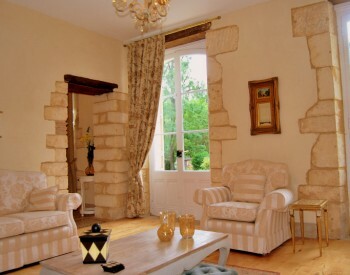 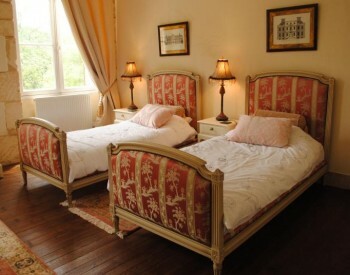 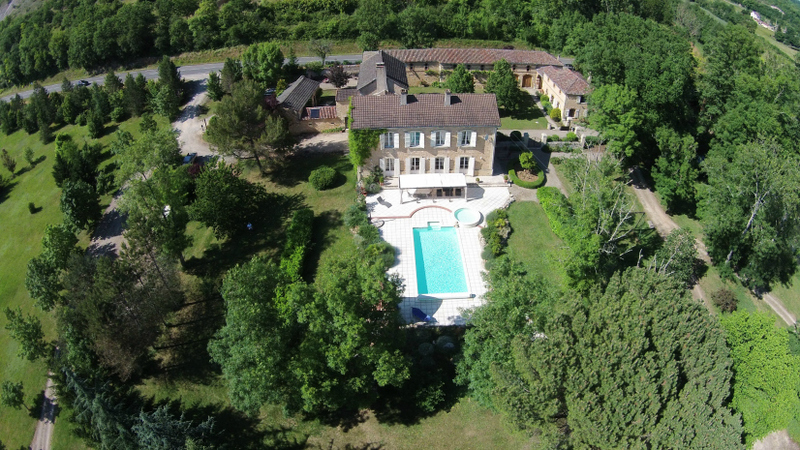 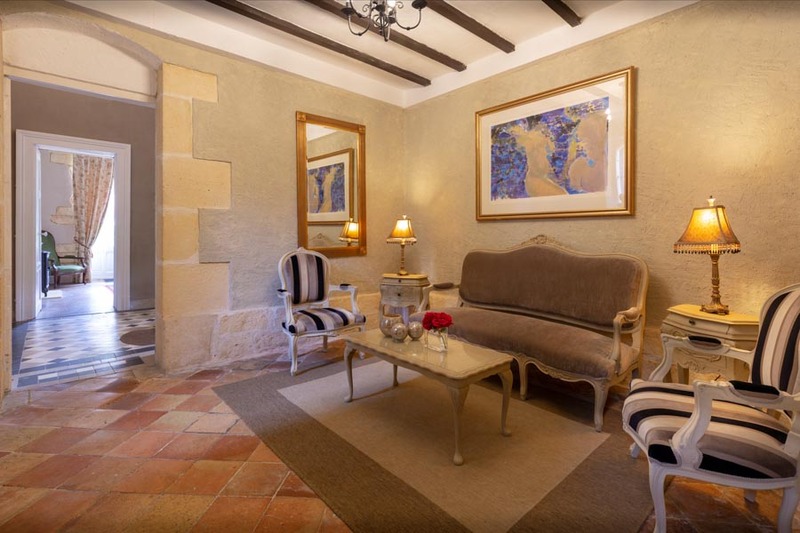 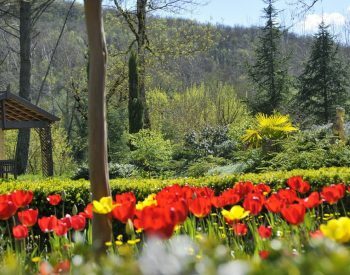 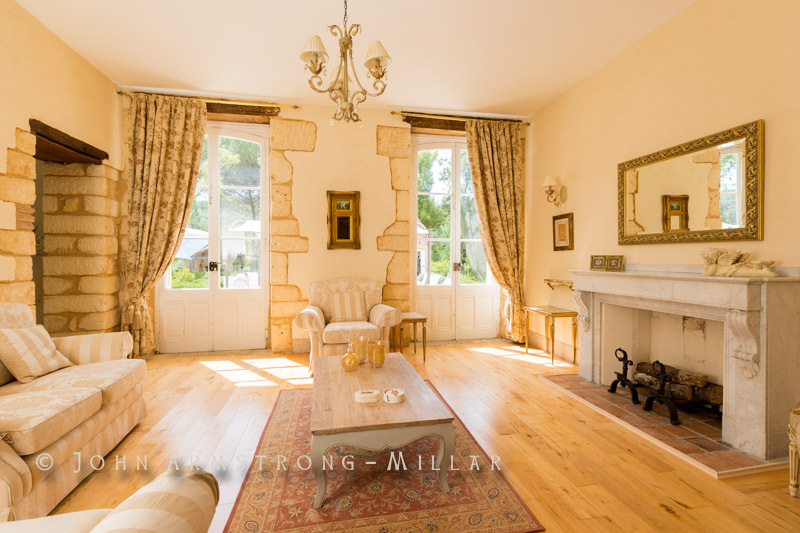 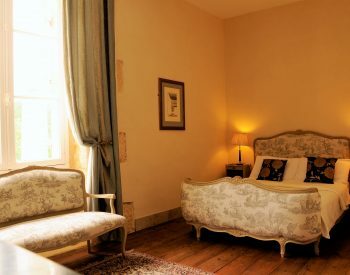 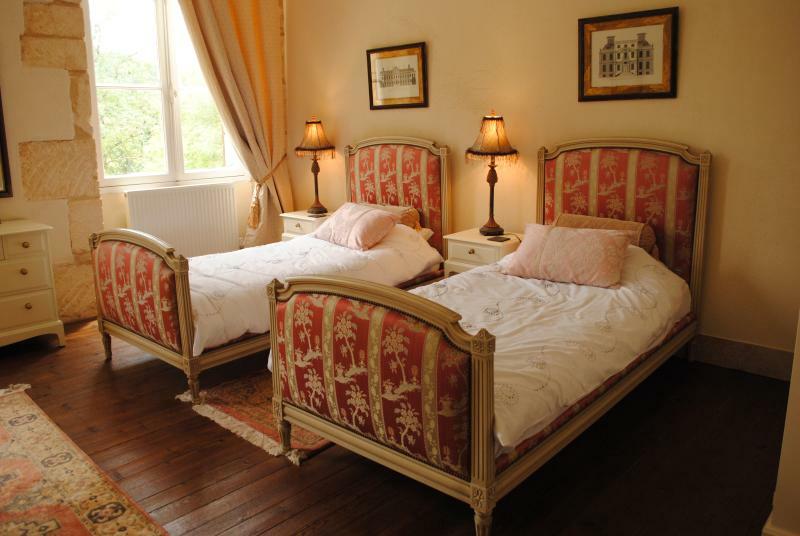 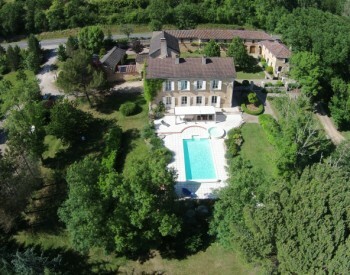 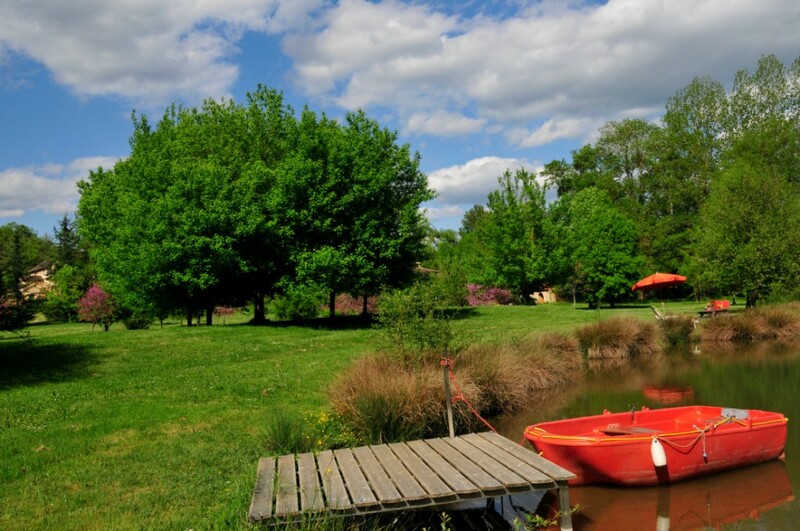 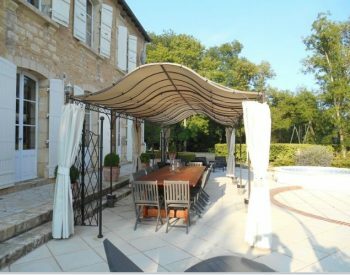 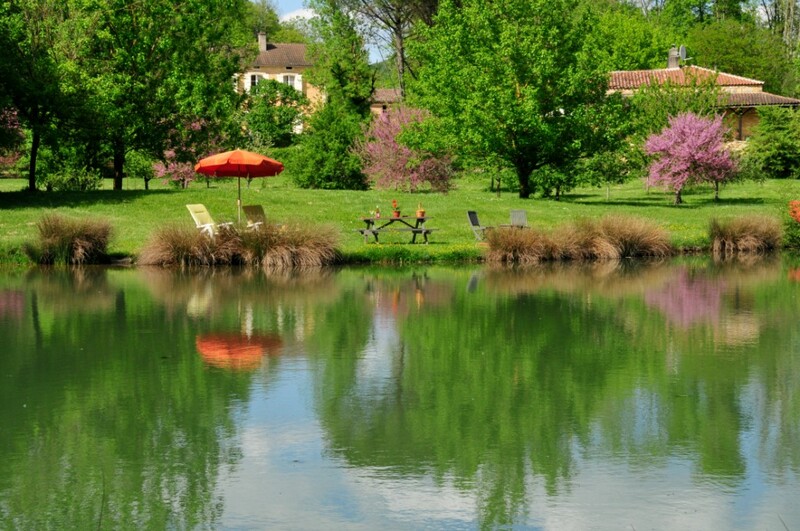 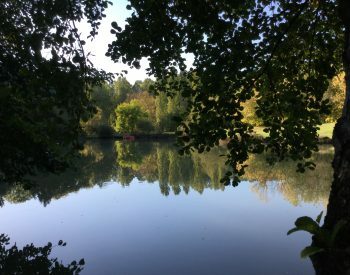 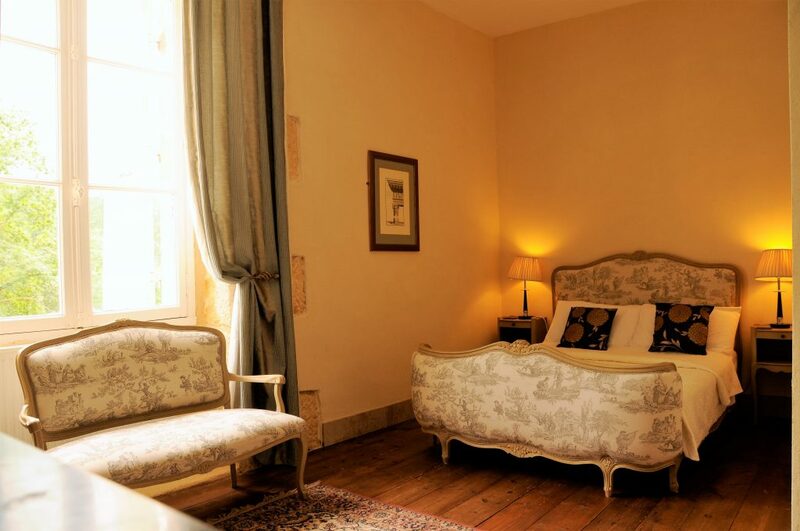 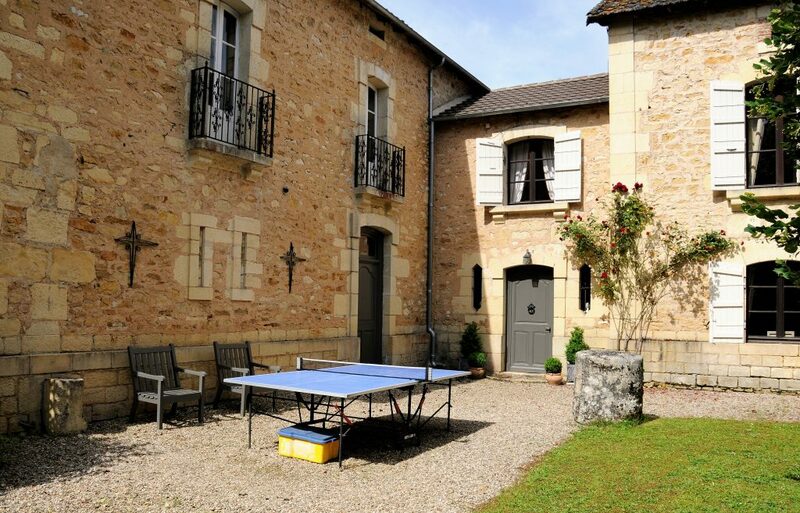 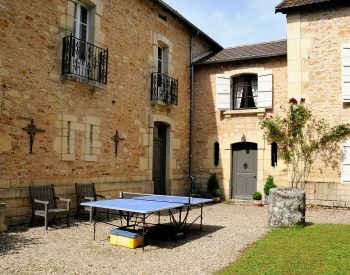 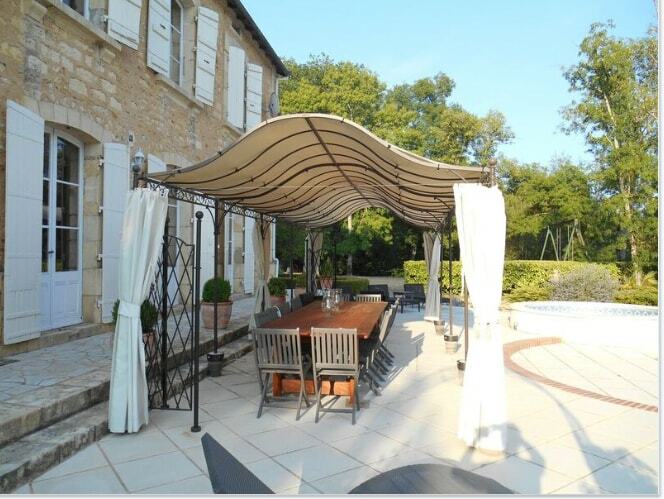 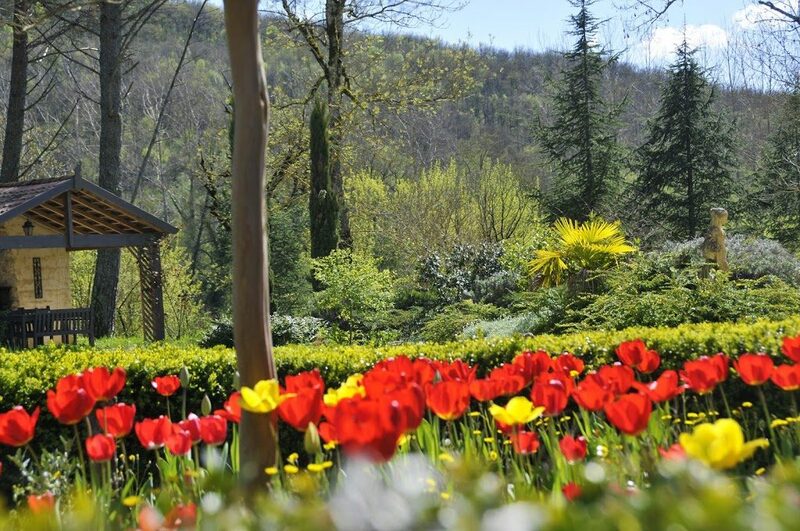 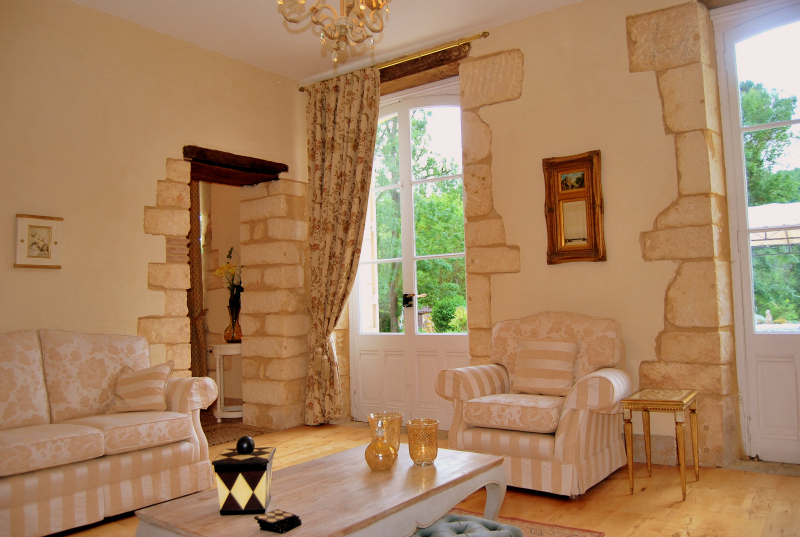 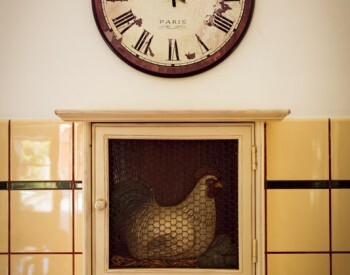 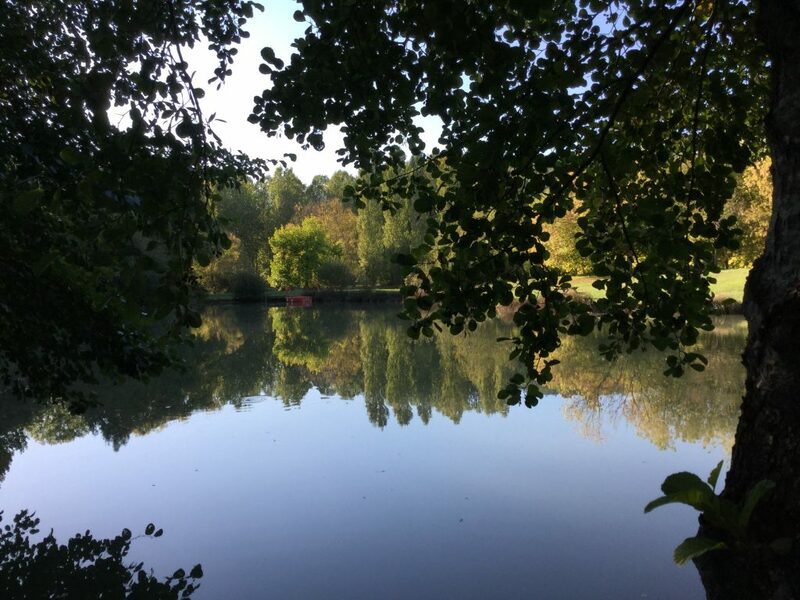 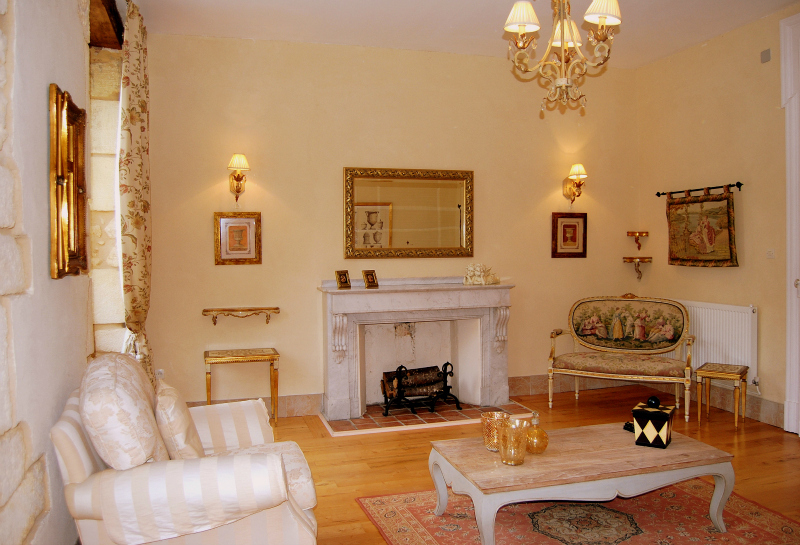 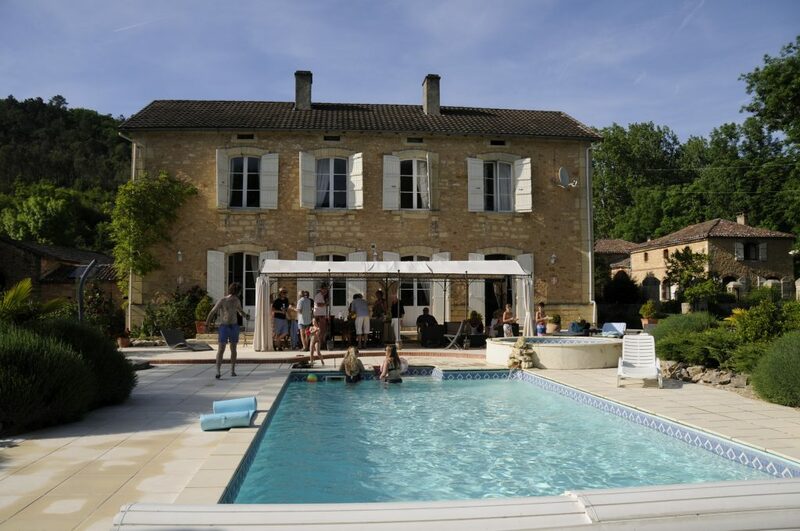 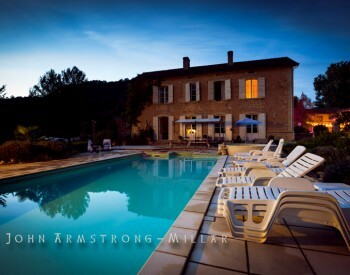 Manoir Seguinet is our beautiful 18th century Manor House, sleeping 12 guests. 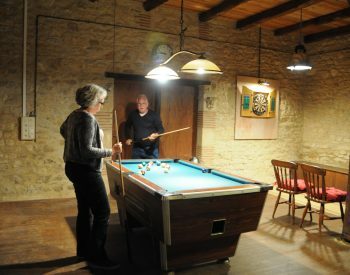 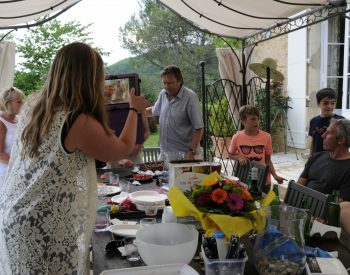 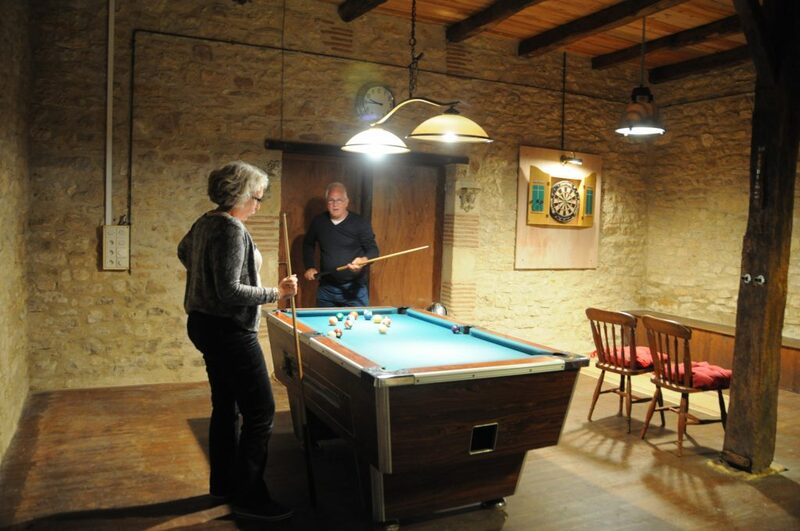 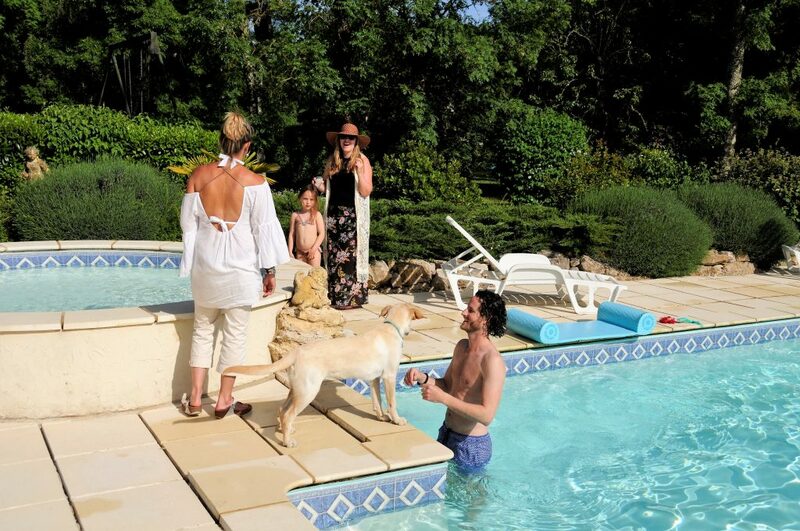 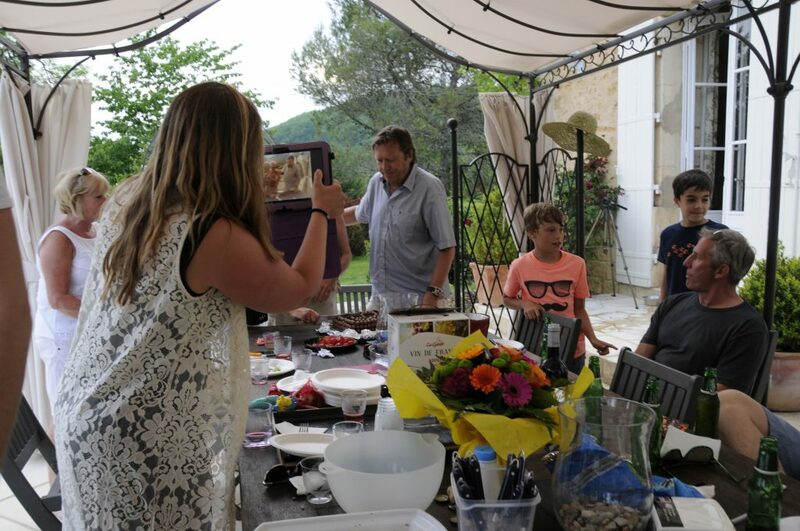 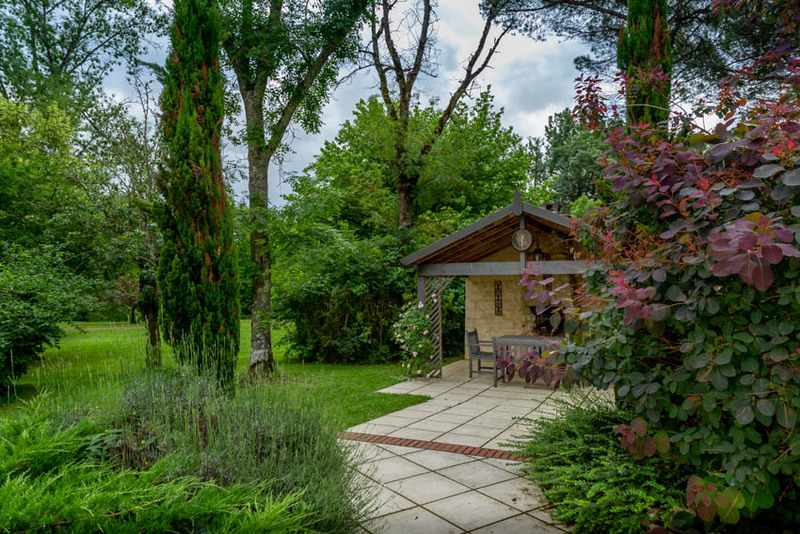 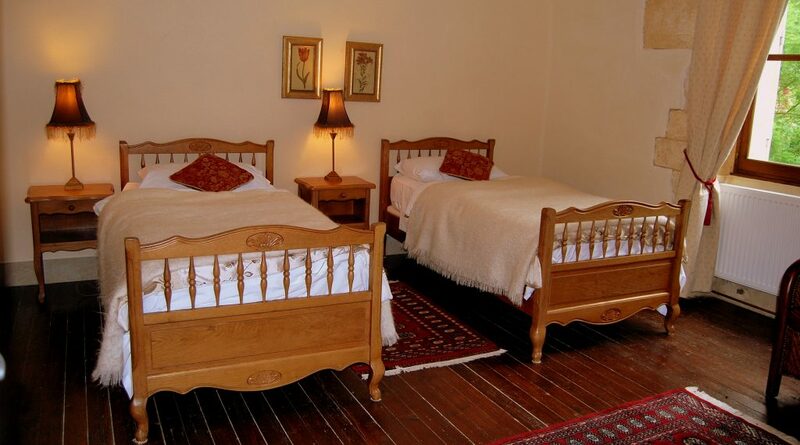 The luxury accommodation is perfect for family and friend group holidays. 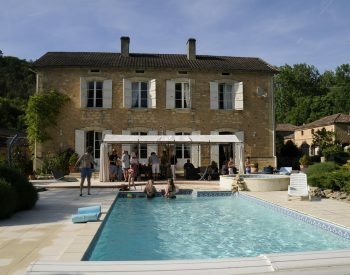 wedding parties, even as a film location! 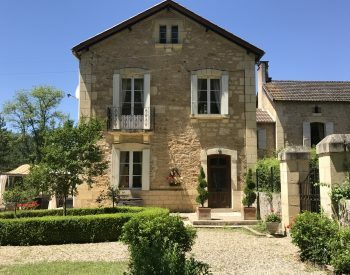 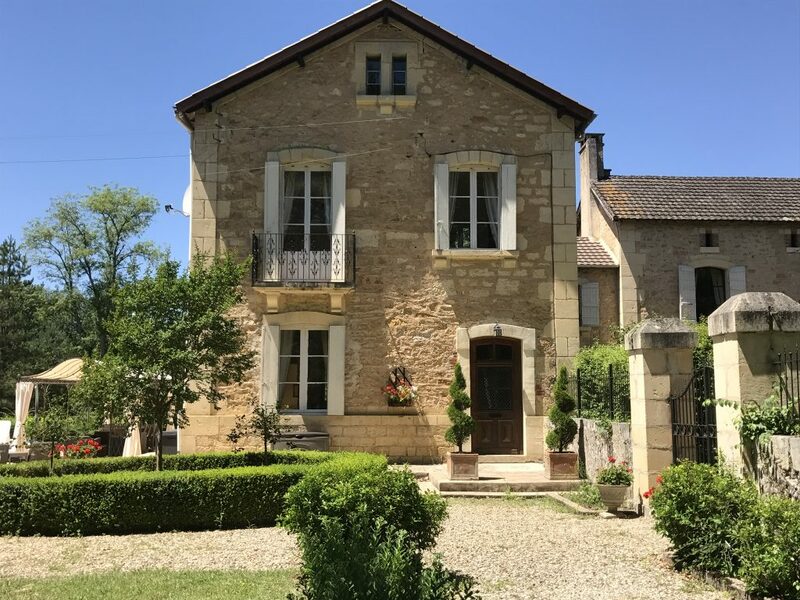 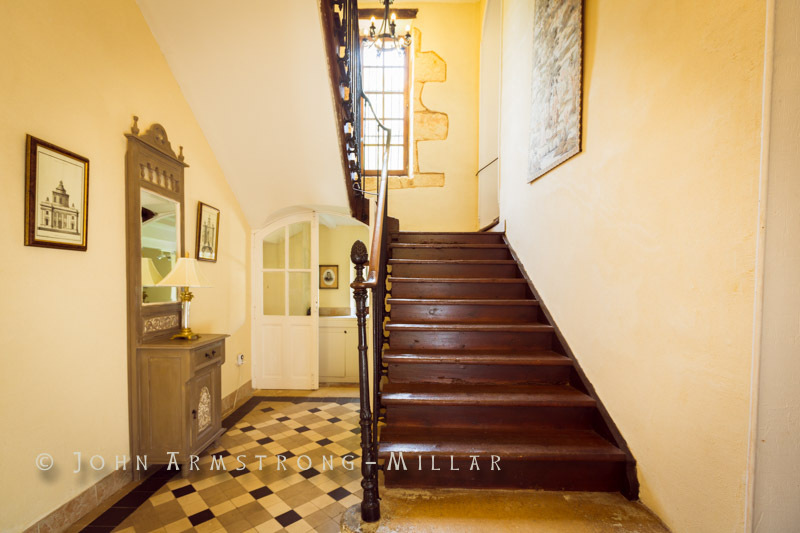 The maison d’maitre (master’s house) belonged to the main landowner in the village of Saint-Front-sur-Lemance. 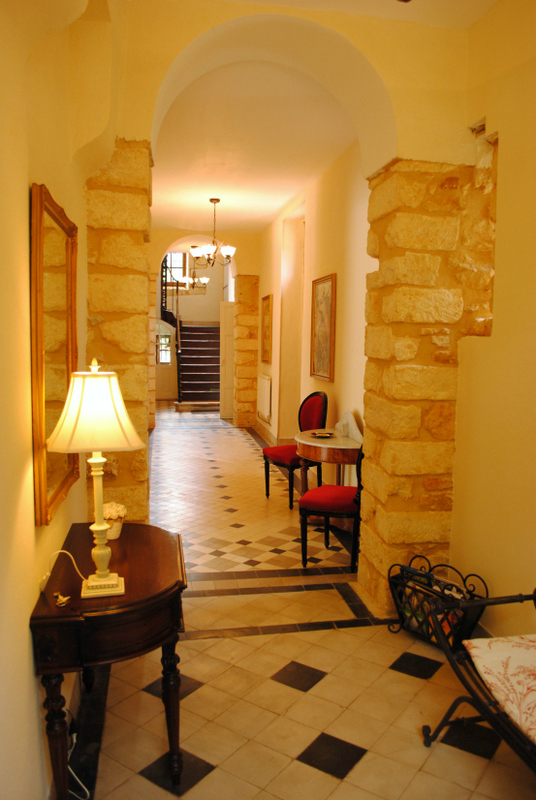 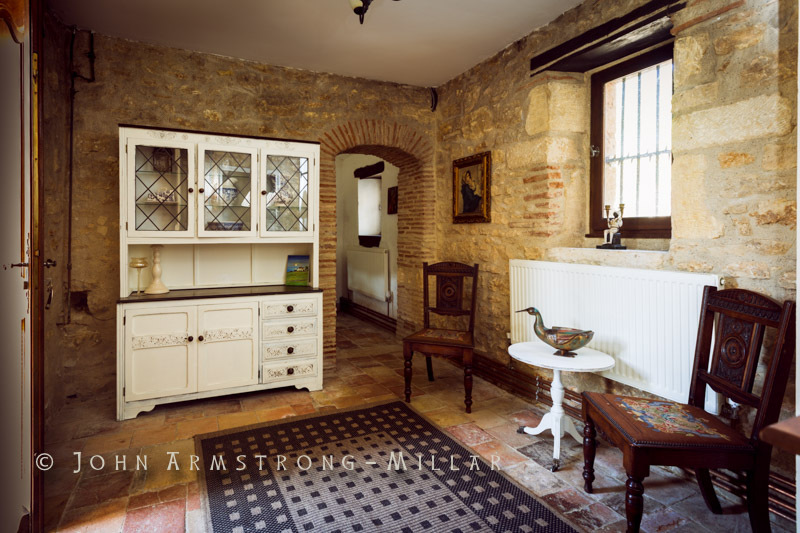 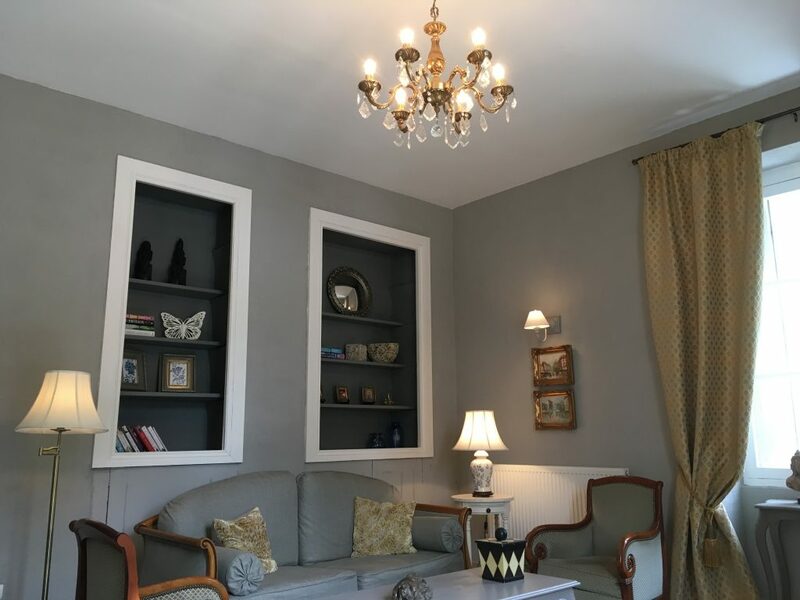 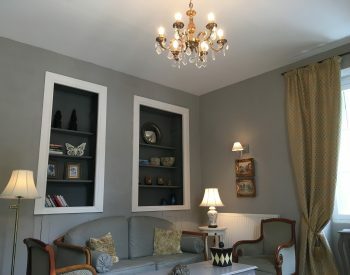 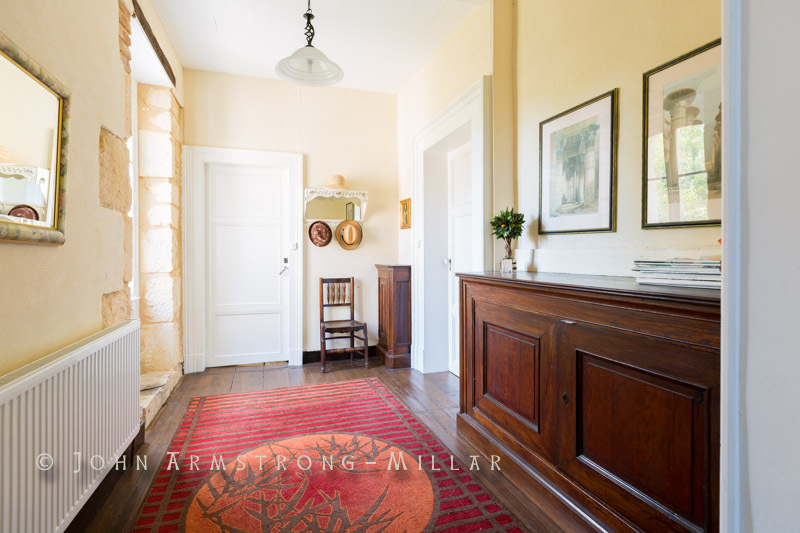 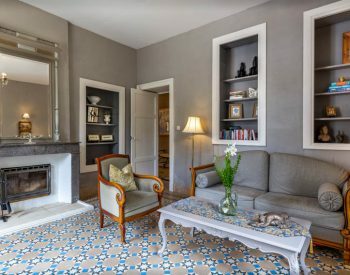 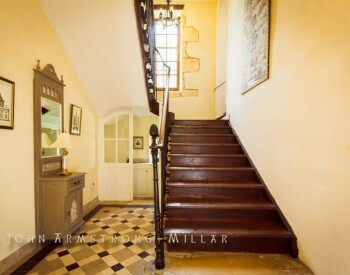 Over the years we have lovingly and painstakingly restored many of its original features, including its exposed original stonework, high ceilings, traditional wooden staircase, period-style large doors and the long tiled corridor, which dominates our spacious and extraordinary house. Beautiful, full height French doors open out to wonderful views of the gardens. 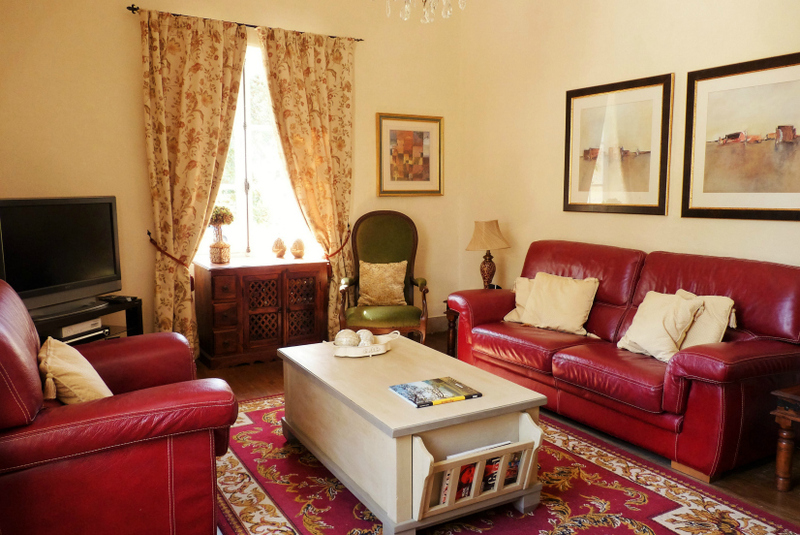 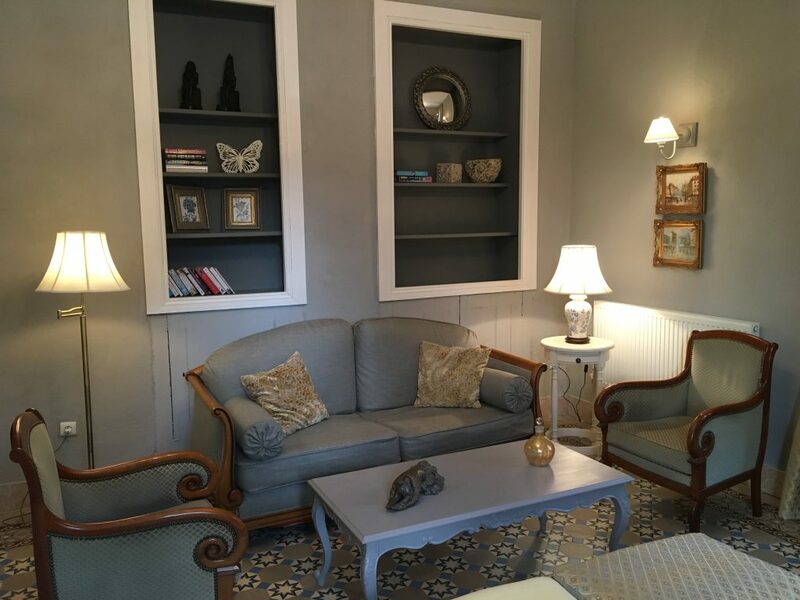 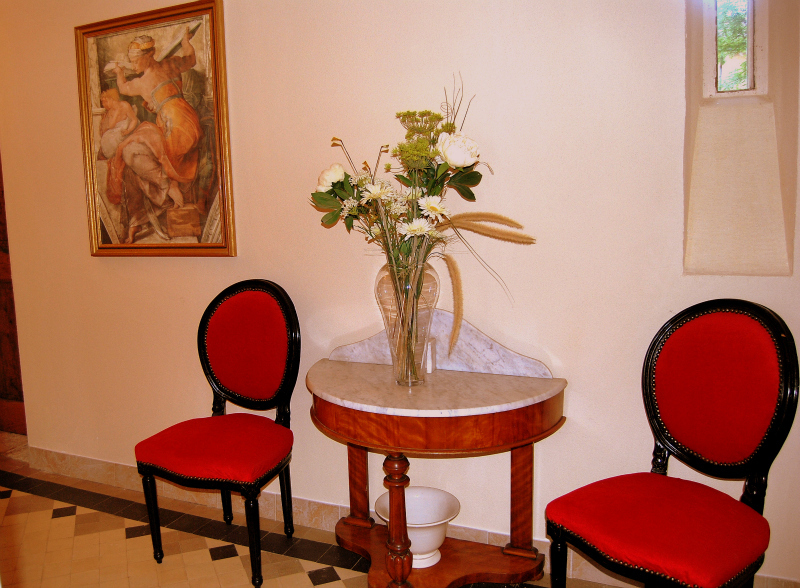 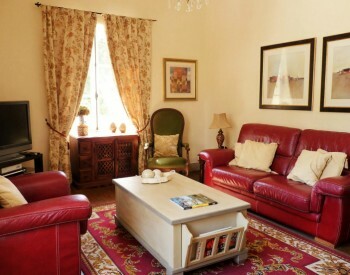 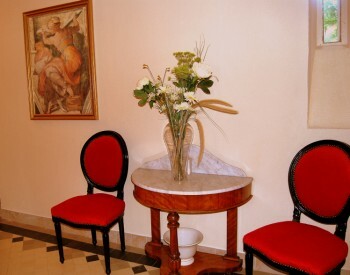 Our home has been furnished with our guests’ comfort in mind. 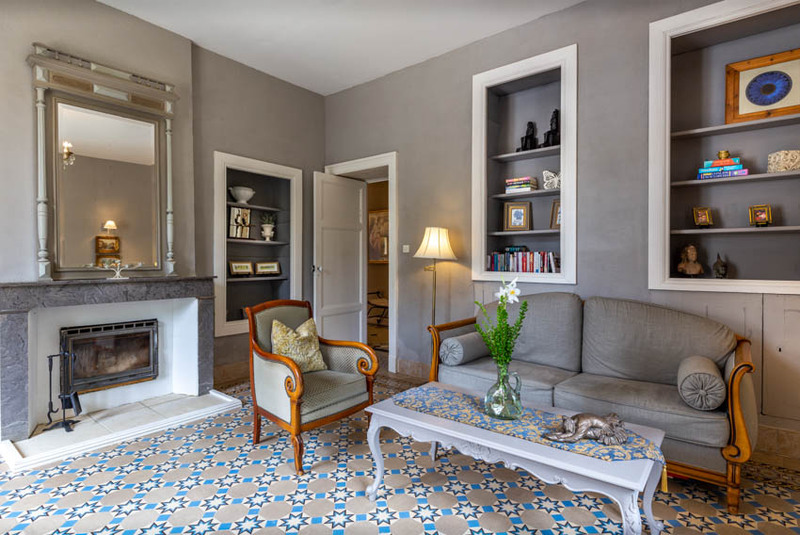 The first reception room has original mosaic flooring and a log burner, the blue leather suite complements the blue mosaic flooring. In-built book shelves contain various books and games for all the family, plus there is a large large flat screen TV with British channels. 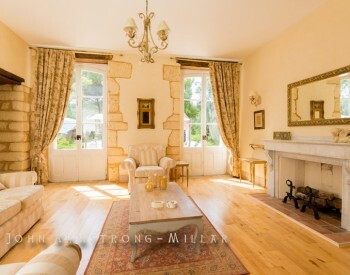 The second reception room is bright and airy with light coloured hardwood flooring and natural colour furnishing and decoration. 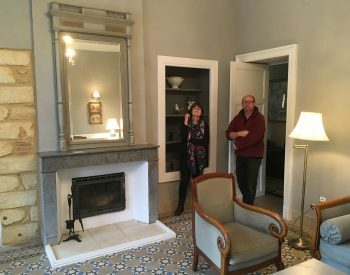 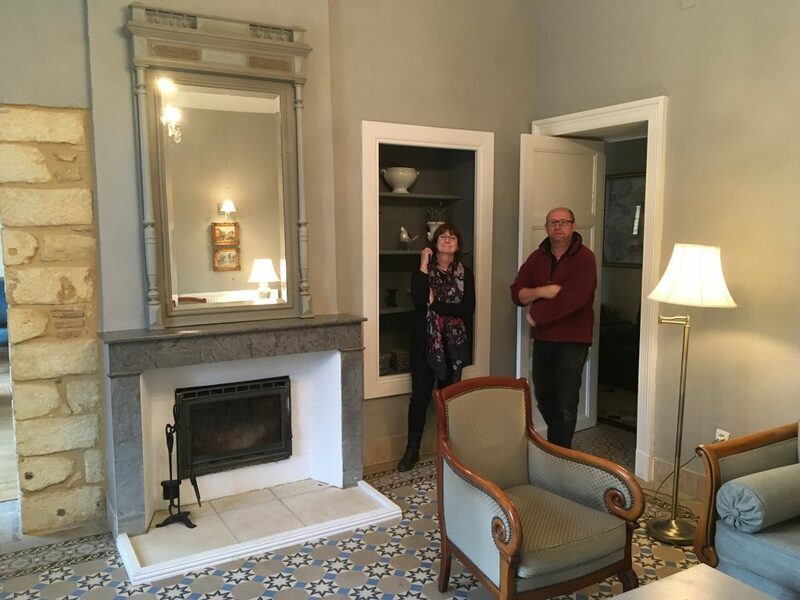 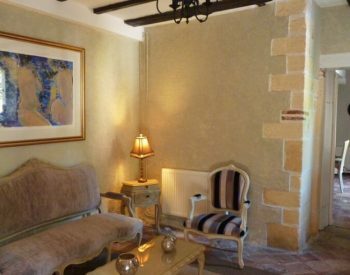 We have filled this room with interesting objet d’art that we have found on our travels, and a warm tapestry hangs on the wall. 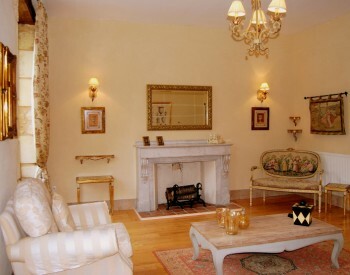 A fireplace keeps the room cosy on cooler evenings. 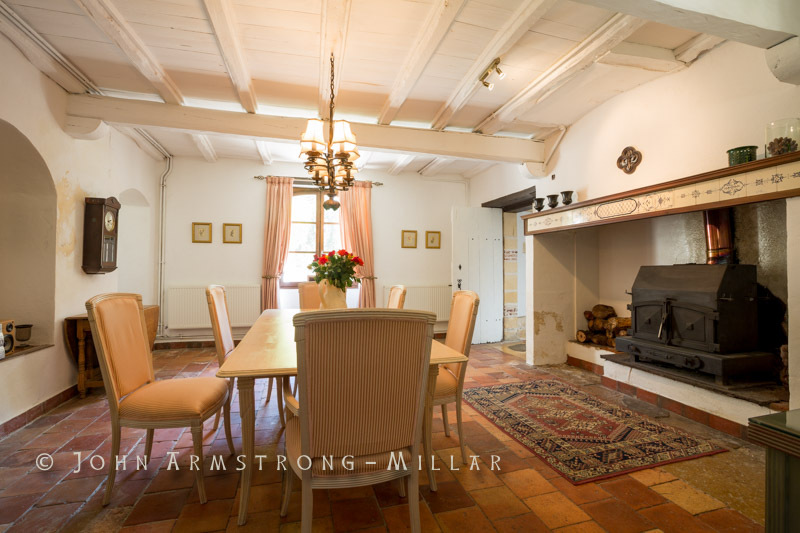 The spacious, provincial-style dining room provides plenty of room for entertaining, with a comfortable six seater dining table. 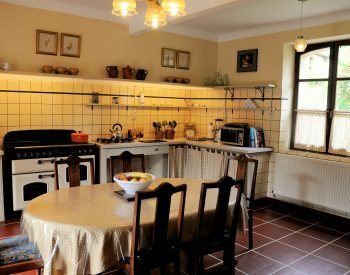 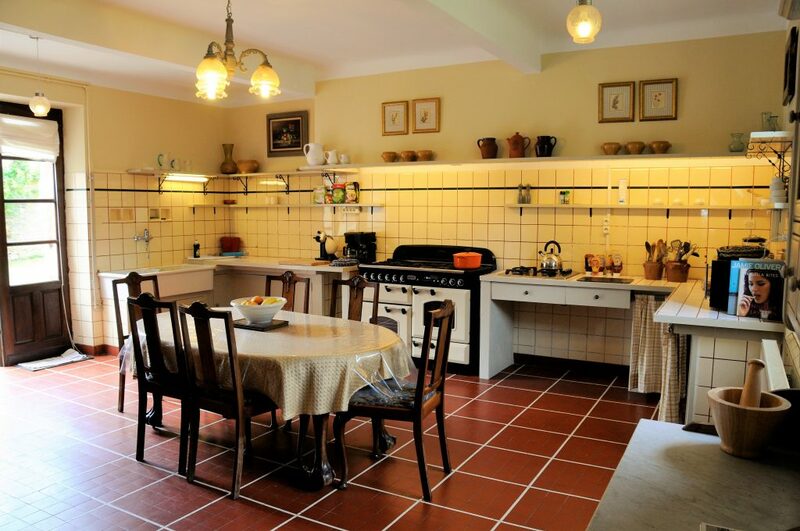 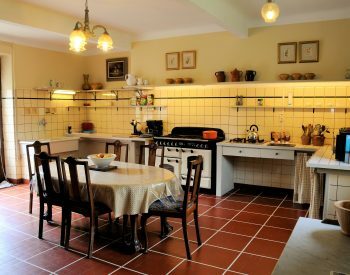 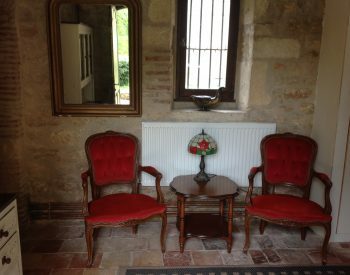 There is an option to add another dining table and chairs to six a further six guests, should the need arise to eat indoors. 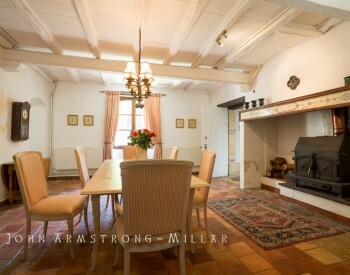 There is also a traditional log burner for cosy autumn/winter stays and a beautiful exposed wood beam ceiling. 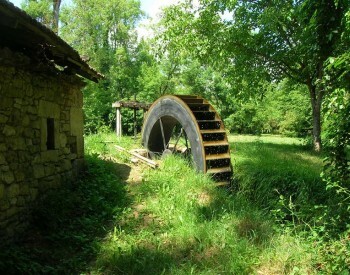 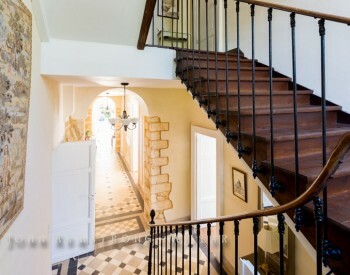 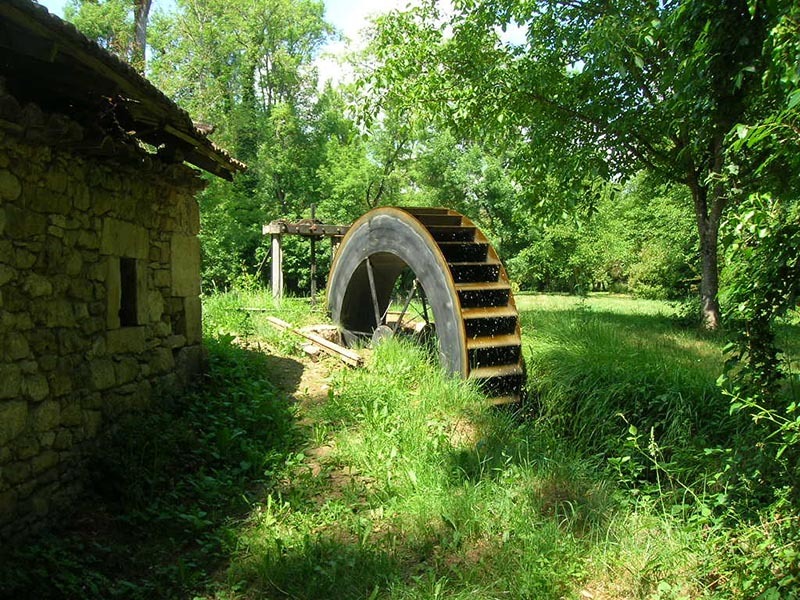 An original wooden staircase takes you up to the first landing, which looks out to a different aspect of the grounds. 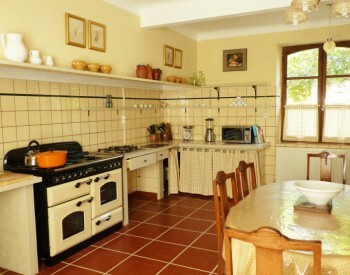 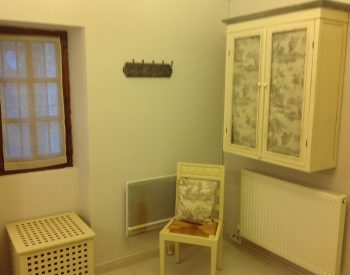 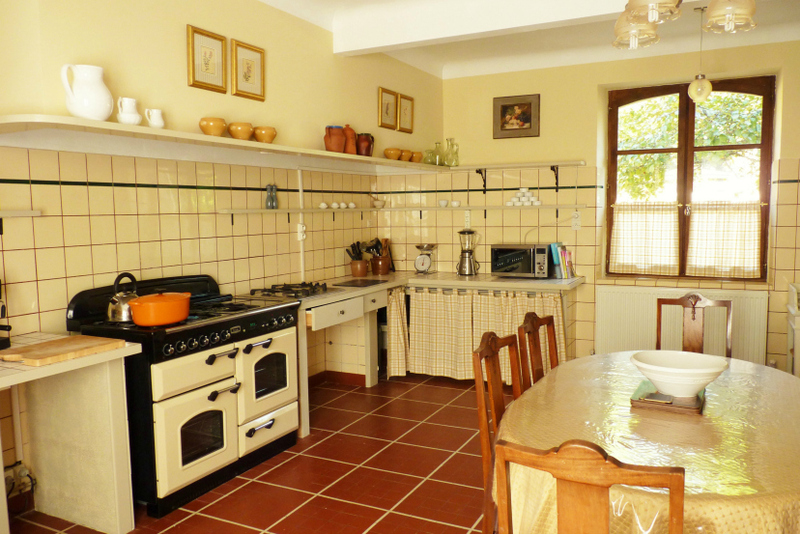 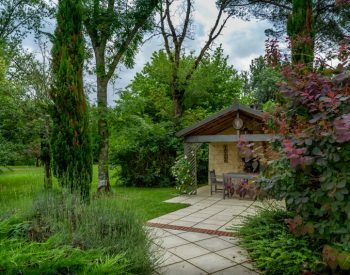 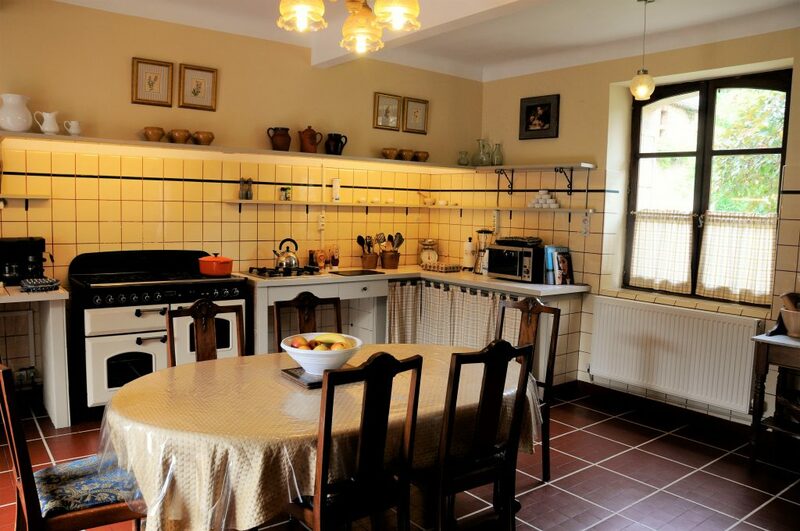 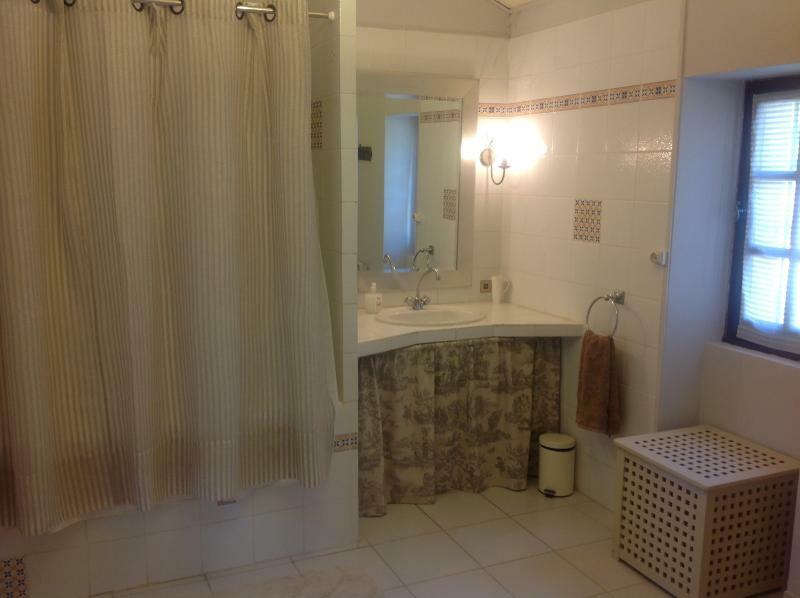 Here you’ll find three comfortably furnished bedrooms and a large family bathroom with a shower and bathtub. 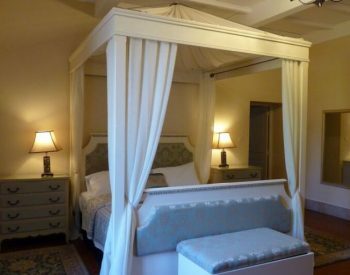 The master bedroom boasts a four poster King Size bed and a big stone fireplace. 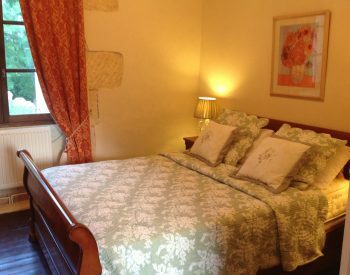 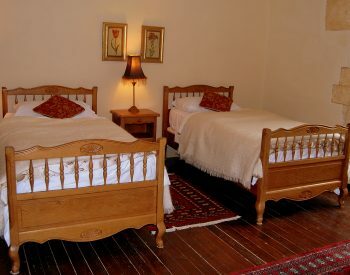 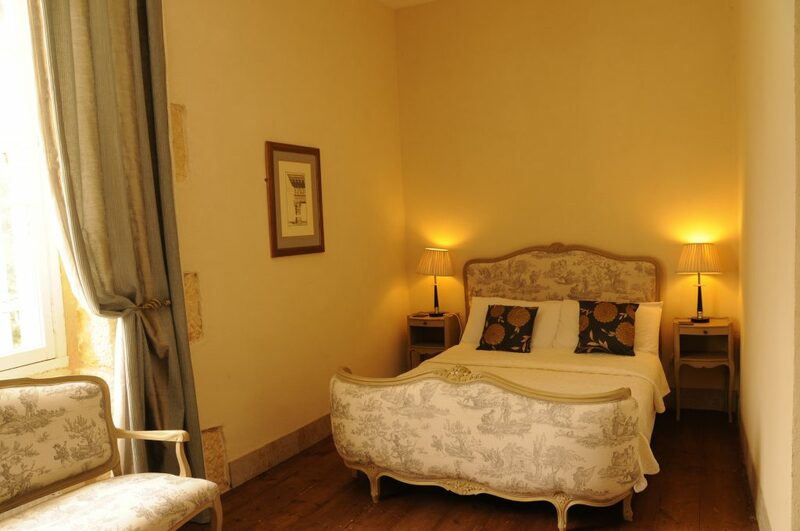 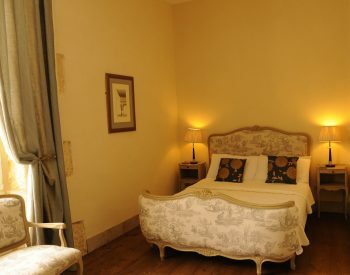 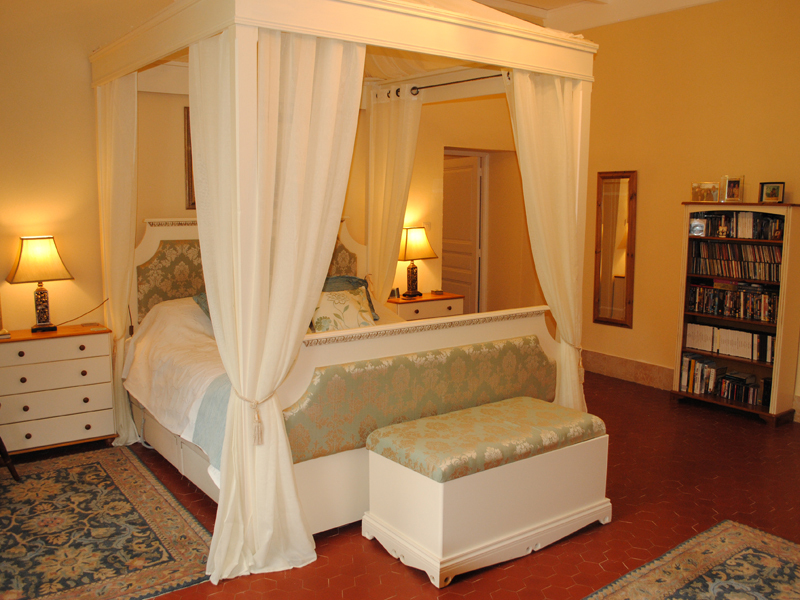 The second bedroom is furnished with twin beds and the third with a King Size bed. 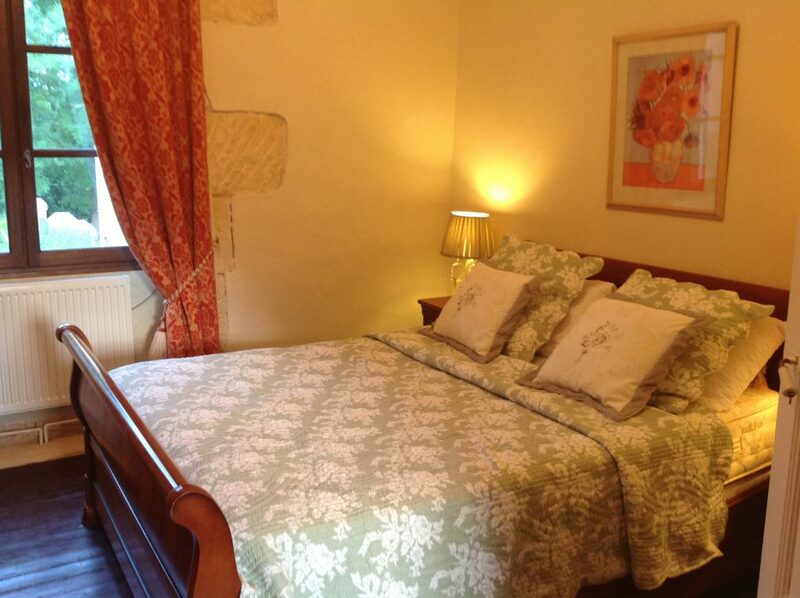 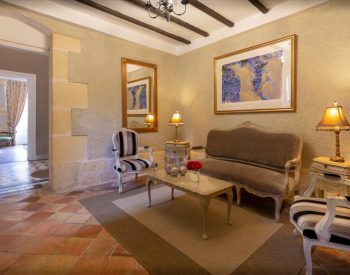 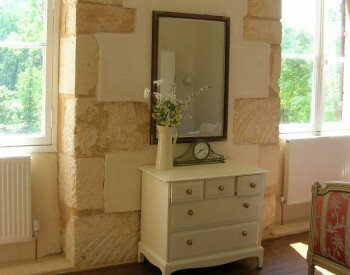 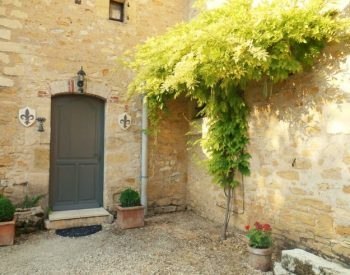 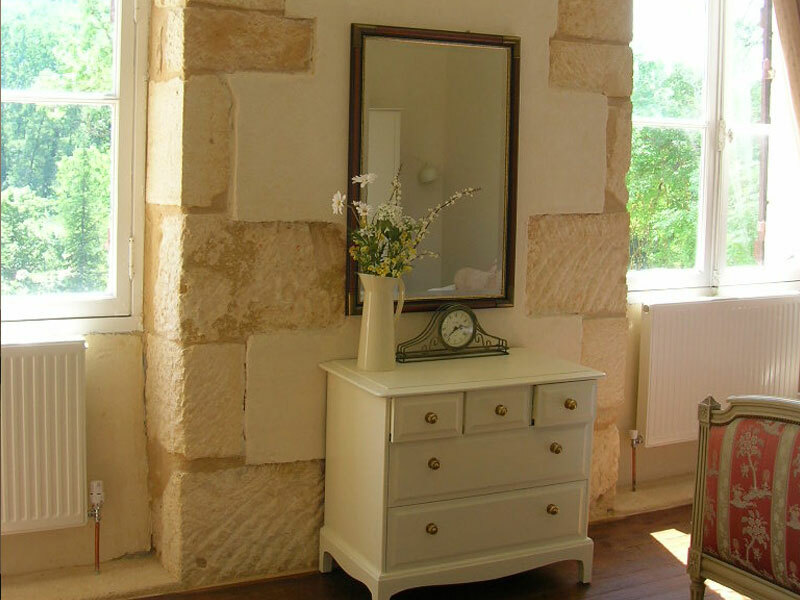 All the bedrooms have wardrobes and chests of drawers and look out onto the pretty fountain courtyard. 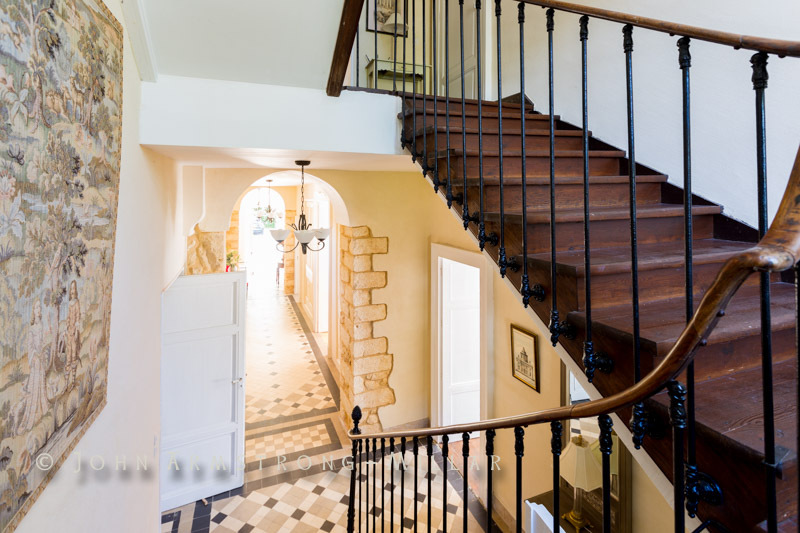 Head up another flight of steps and you find yourself in the south wing, with three further bedrooms overlooking the swimming pool and across to the valley. 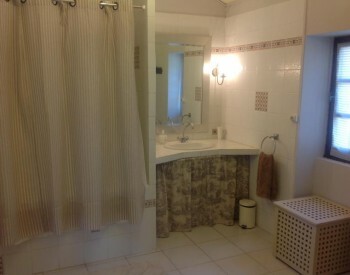 All three bedrooms have ensuite showers with toilets. 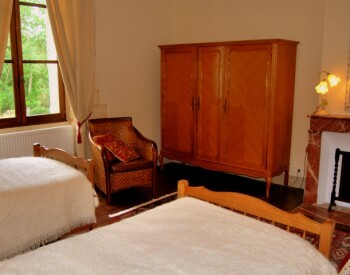 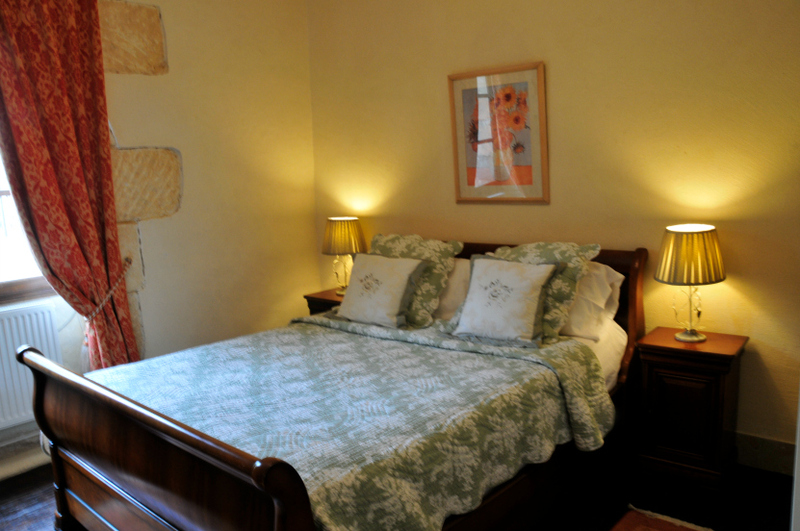 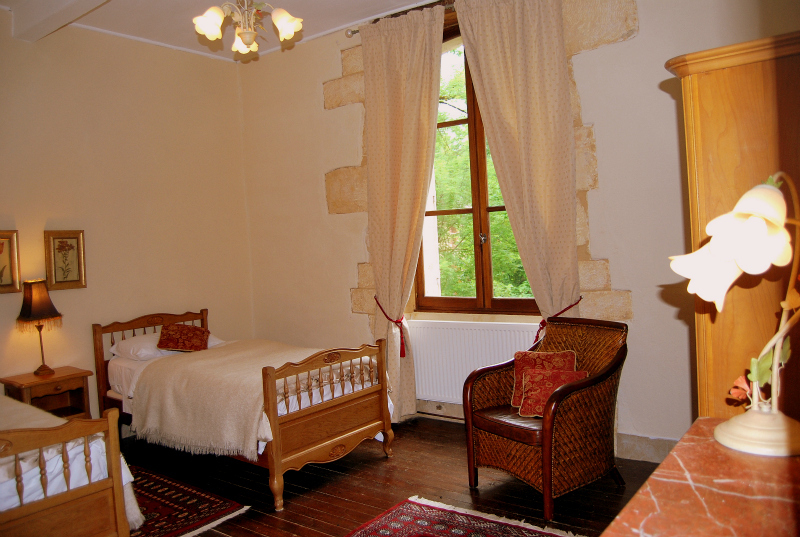 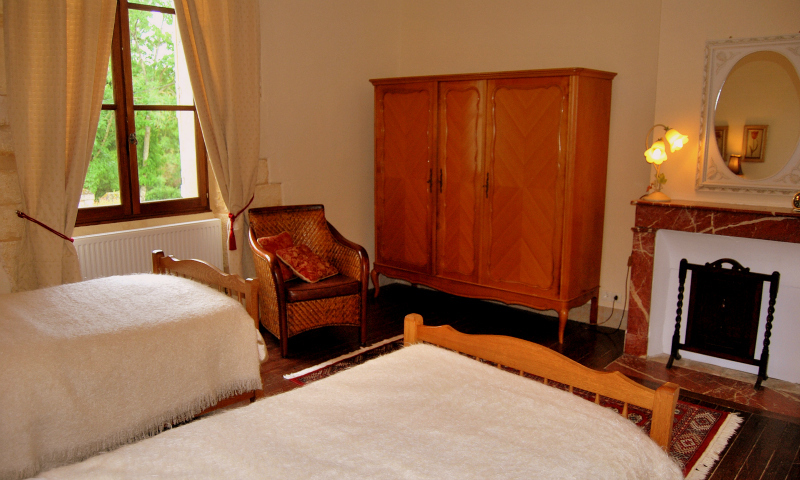 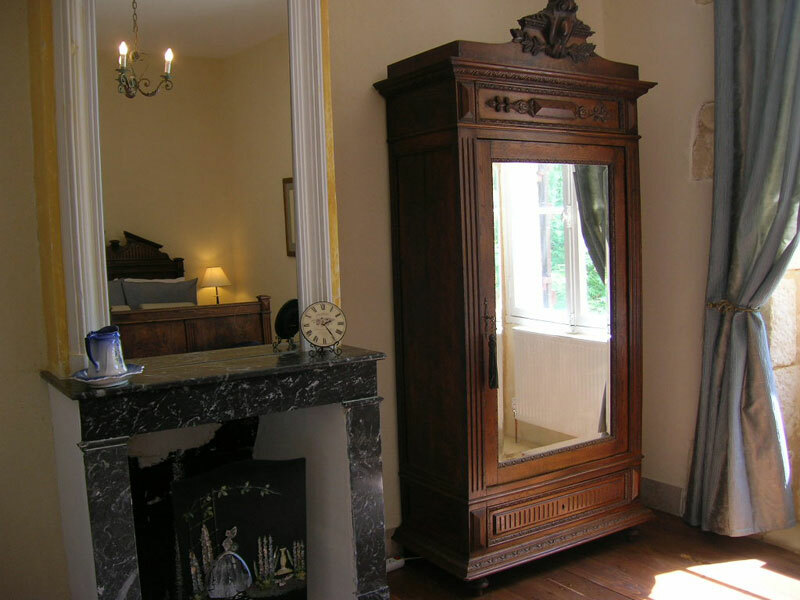 The first bedroom has a traditional upholstered French double bed and wardrobe. 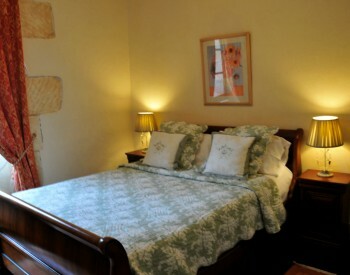 The second bedroom has two single beds, a chest of drawers and two wardrobes. 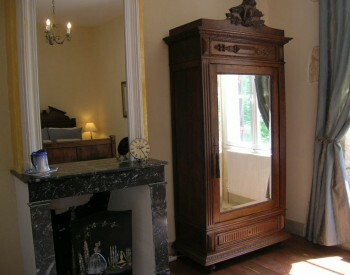 The third has a Super King Size bed and a large armoire. 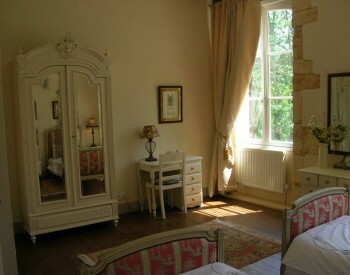 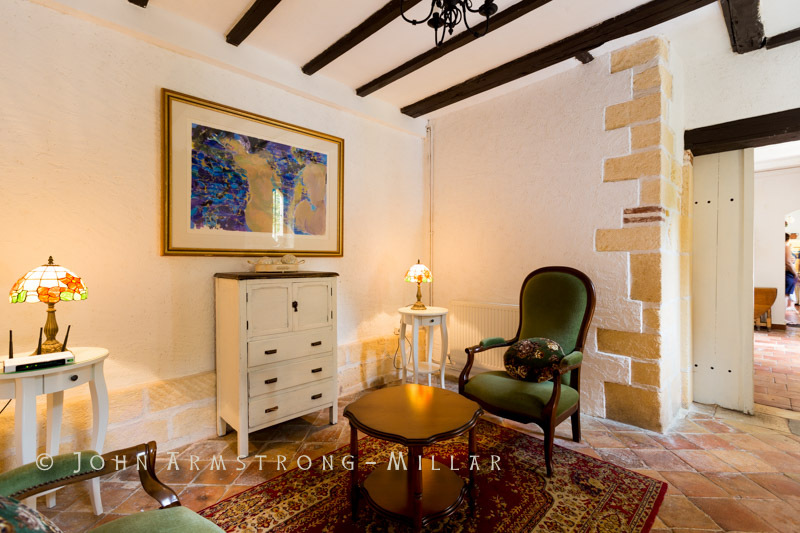 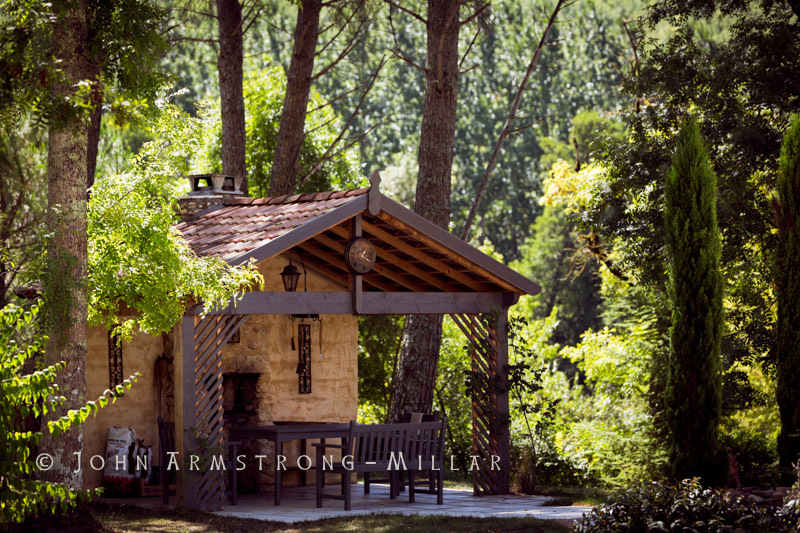 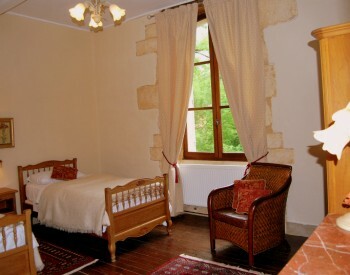 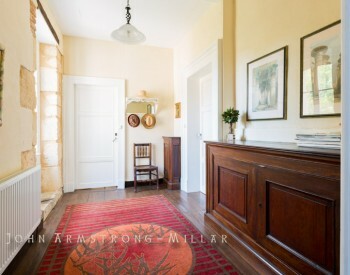 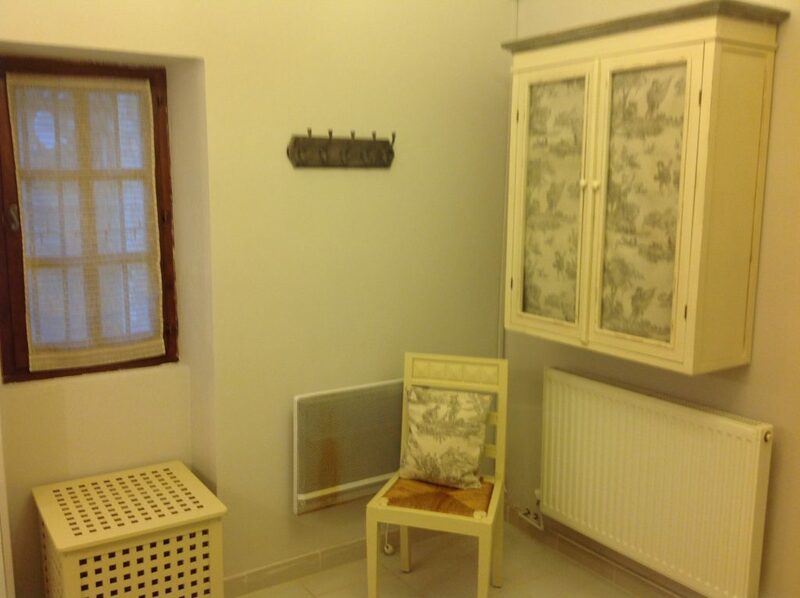 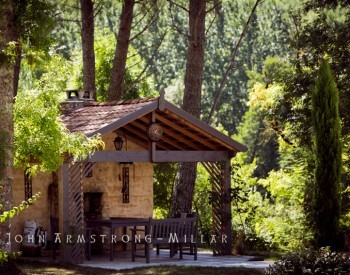 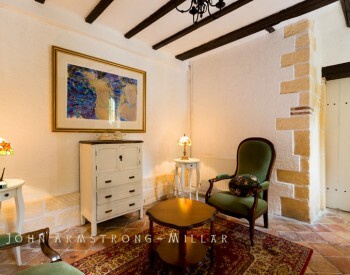 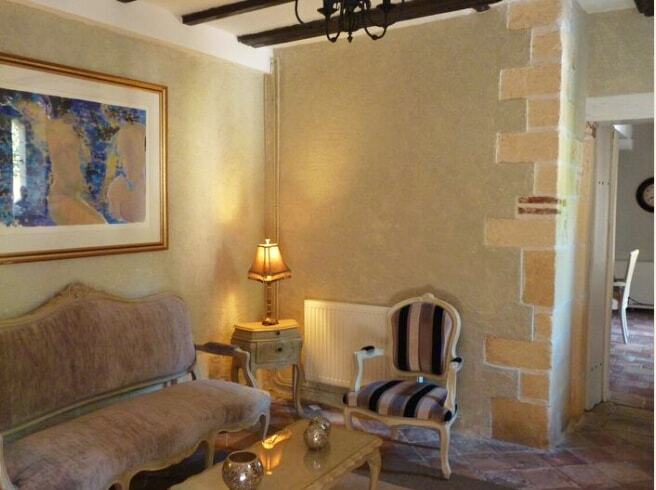 This room also has a charming little Juliet balcony, which overlooks the mill race and the grounds. 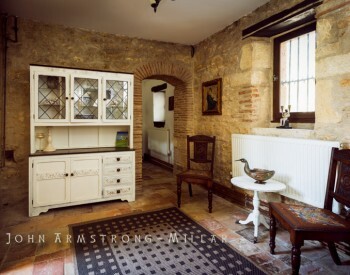 The main entrance to the property is from the parking area into an open reception space, with a little office through the alcove. 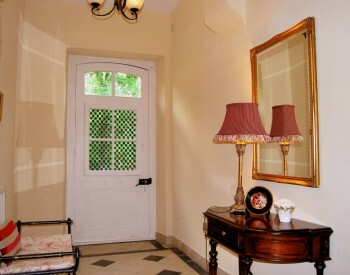 Although there are three entrances to the house, we use the one closest to the car park. 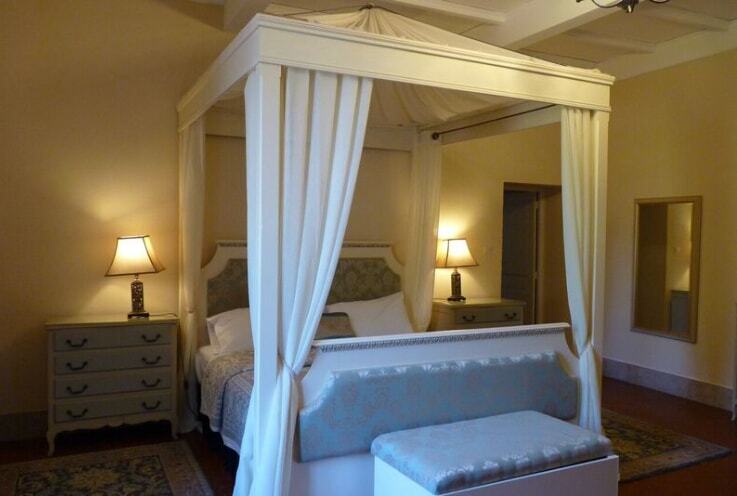 We can supply a child’s travel cot and high chair upon request. 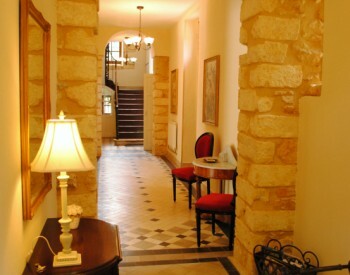 Free Wifi is available in every room. 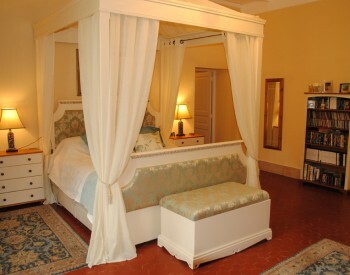 Book your stay. 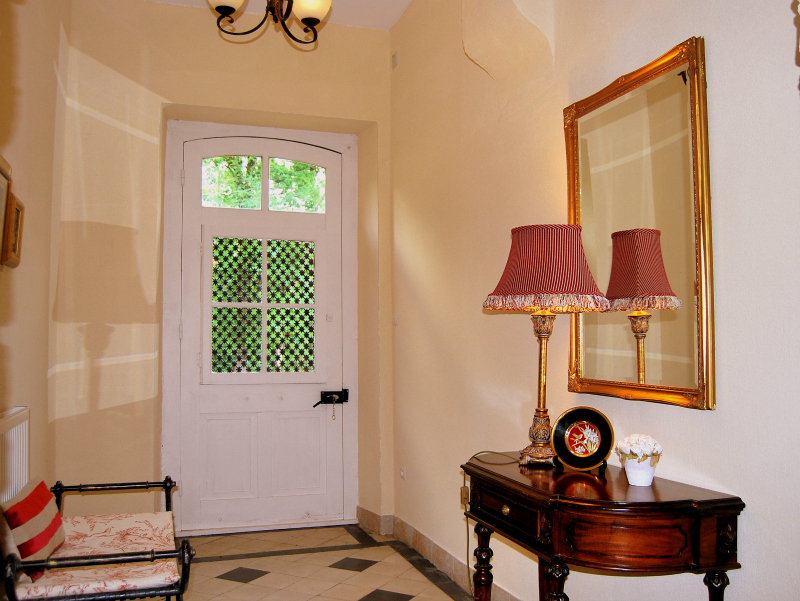 We're waiting to welcome you to The Manor House.